Gerald and Serene Buhrz were among the lucky ones. When they fled their home at 2:00 a.m. on Oct. 8, 2017, the flames of the massive Tubb Fire had already engulfed most of the Fountaingrove neighborhood on the north side of Santa Rosa, Calif. They returned to their devastated street eight hours later to find their two-story stucco home still standing. It was surrounded by the embers of burned houses but untouched by flames. Not all fire damage, however, is visible to the eye. When Serene Buhrz turned the water on for the first time several days later, the chemical smell from their kitchen tap was overpowering. "It was so strong you felt like you couldn't light a match," said her husband Gerald. He called the city water department immediately, and got the agency to send someone to test the water. Santa Rosa Water found the problem was not confined to the Buhrz home. 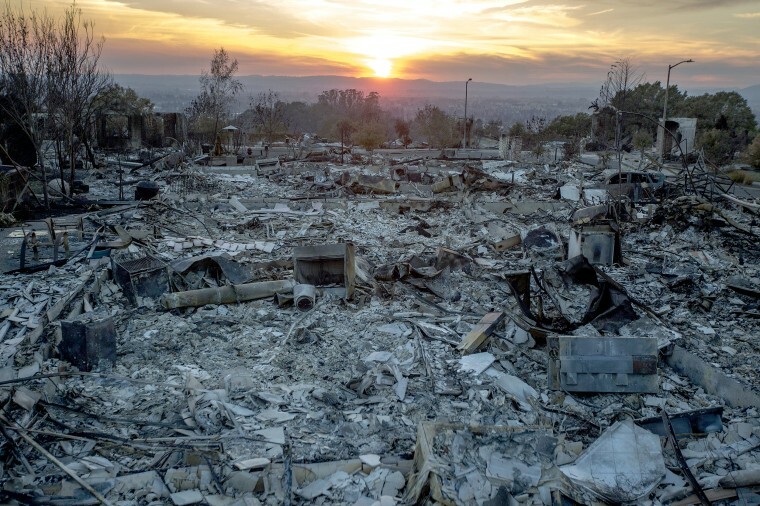 Throughout Fountaingrove, plastic water pipes had melted as houses burned, releasing a carcinogenic chemical called benzene into the neighborhood's water system. For nearly a year after the fire, Fountaingrove residents were told not to drink water from the tap, even if it was boiled first. Though their home was spared, the Buhrzes chose to live in a hotel for the 11 months of the advisory. "You couldn't drink it, couldn't take a bath in it. You really couldn't do anything with the water so we just stayed out," said Gerald. The couple eventually returned home but Serene Buhrz still relies on bottled water. "She still doesn't trust the water yet," said Gerald. As more people build homes in fire-prone areas, and as climate change and other factors increase the frequency of fires, there is a growing risk to life and property throughout the West — and a lesser known risk to the region's already endangered water supply. At least 65 percent of the public water supply in the Western U.S. comes from fire-prone areas. Blazes like the Tubb Fire and 2018's massive Camp and Carr wildfires can expose the drinking water for millions of people to the risk of contamination by toxic chemicals and parasites. Experts are concerned the new scale of wildfires torching urban areas could cause damage to public water supply that isn't immediately apparent. "Lots of structures, vehicles, and man-made materials were involved in the Camp and Carr fires and there isn't a lot of information on how the environment is affected when these materials burn," said Clint Snyder, assistant executive officer of California's Central Valley Water Board. The concern is prompting more intensive water testing programs following wildfires and spurring utility companies to invest in wildfire mitigation projects across the West. One-third of U.S. homes are now built in what's called wildland-urban interface (WUI) areas, areas near or on land prone to wildfire. It's the fastest-growing land use type in the continental U.S. According to U.S. Forest Service data, in just 20 years, new WUI areas grew by more than 46 million acres, covering an area larger than Washington State. When these homes become wildfire tinder, insulation, roofing and home furnishings release toxins as they go up in flames, creating new sources of water contamination. In addition to releasing toxins into the water supply, fires kill healthy tree roots. Without the roots, contaminating sediment and ash are flushed by rain into the reservoirs, rivers and lakes that supply cities with drinkable water. In 2017 the U.S. Geological Survey published a study that predicted wildfires could double the amount of sediment in a third of the largest western watersheds by 2050. In some areas, sediment could increase 1,000 percent, potentially carrying parasites and harmful metals and chemicals with it. According to representatives at the California State Water Resources Control Board, bacteria and parasite contamination, rather than chemical contamination, are the main worries in the wake of the Camp Fire, which burned 153,000 acres and 19,000 structures north of Sacramento, killing at least 86 people. In Paradise, the town most affected by the Camp Fire, 22 out of 24 water systems were tested for contamination and cleared at the time of writing this article, but until the remaining two can be confirmed as uncontaminated, a Boil Water Notice, first released on Nov. 9, will remain in effect. "My number one issue by far is actually not chemicals but intestinal issues due to parasites," said Gina Solomon, a clinical professor of medicine at the University of California San Francisco. Solomon's biggest concern is a parasite called cryptosporidium. When bare soil is exposed because vegetation has burned, the sediment that is flushed into water sources often contains spores of the intestinal infection-causing parasite. While a discomfort to healthy people, cryptosporidium can become life-threatening to people who are undergoing chemotherapy, have AIDS, or are elderly. "Cryptosporidium form spores and that's a problem because spores are like armored tanks, encasing the pathogen in a way that allows it to invade even significant amounts of chlorine," said Solomon. The increased sediment also creates a costly problem for water treatment plants. Sediment clogs the microfiltration systems that filter parasites in large water treatment systems, requiring expensive clean-ups. In 2002, the Hayman Fire cost Colorado utility company Denver Water $27 million, when heavy rains following the fires washed sediment, fallen trees, and man-made debris into the Stronita Springs and Cheeseman Reservoirs. The contaminants had to be filtered out before the water was safe for consumers. To date, the Tubb Fire is one of California's starkest examples of post-wildfire water contamination. Before last year's larger, deadlier Camp Fire, it was the most destructive California wildfire ever recorded. It burned nearly 37,000 acres, 5,636 homes and businesses, and killed 22 people. But despite the scope of the blaze, it took a phone call from Gerald Buhrz to alert local authorities to the possibility of water contamination. "If [he] hadn't called in to report a chemical smell in the water, we may never have known about it," said Bennett Horenstein, who was director of Santa Rosa Water during the fire. "It makes me wonder how many times this has happened and gone unreported." In total, the City of Santa Rosa had to spend $8 million replacing hydrants, valves, and other water system components in 352 properties, including 1,265 feet of water main. "What happened in Fountaingrove should be a learning opportunity for water systems nationally," Horenstein said. Awareness of the risk is increasing. In the more than 244-square-mile burn area left by November's Camp Fire, officials have launched a months-long water monitoring program and will sample surface water at least seven times through spring 2019. Samples in the Camp Fire burn area will be tested for levels of pollutants including mercury, chemicals found in the fire retardant dropped from the air, and PCBs which are commonly found in electronics. As wildfires grow more severe across the country, private companies are beginning to take action. Just days before the Camp Fire began, Blue Forest Conservation, an investment group focused on forest and watershed health, partnered with the Yuba Water Agency, a utility company that services parts of Southern California, to fund wildfire mitigation in one of its watersheds. The public-private partnership, called the North Yuba River Project, will focus on tree thinning and water quality monitoring in the North Yuba River. "The conditions in the North Yuba River watershed are ripe for a fire similar to the Camp Fire. We have those conditions, just not the actual fire yet," said Willie Whittlesey, the project manager overseeing Yuba Water Agency's forest initiatives. To safeguard cities against drinking water contamination, other alliances between private utility companies and public organizations are forming in Arizona, Colorado, Oregon, New Mexico and elsewhere in California. Denver Water, which manages 12 water storage facilities throughout Colorado, announced in January that it's pledging $16.5 million to the From Forest to Faucets Project, a partnership with the U.S. Forest Service that will protect crucial watersheds from wildfire. Colorado has more than 14 million acres of U.S. National Forest land and almost 90 percent of it is located in watersheds that feed public water supplies. Officials in Arizona enacted a plan in July that prescribes tree thinning and controlled burns for the three watersheds that feed the C.C. Cragin Reservoir. The project is funded in part by a local utility company called Salt River Project. "People talk about preparing for what is coming in the future but it's actually what we're seeing now," said Linda Wadleigh, a U.S. Fire Service District Ranger in Arizona." The C.C. Cragin Reservoir, the main source of water for at least 16,000 people in Arizona's high country, is among a federal list of water systems in western states that are most vulnerable to contamination as a result of wildfire. Wadleigh estimated that a wildfire in the watersheds that feed the reservoir could rack up $70 million in damages. Discussion of wildfires typically centers around forest and home destruction, not water, but Wadleigh said the partnerships with utility companies are playing a critical role in simply keeping water safety in the conversation. "Fire mitigation projects are not just urgent because of the fact that people live near these forests, but the fact that people live downstream from these watersheds," she said.